12/26 – Mr. and Mrs. Gabai on the birth of a girl! 12/27 – Mr. and Mrs. Yehuda and Dina Schonfeld on the birth of a boy! 1/3 – Mr. and Mrs. Dovid Nadel on the birth of a grandson! 1/13 – Mr. and Mrs. Mutty and Chaya Leah Lebovits on the birth of a boy! 1/15 – Mr. and Mrs. Kalman Canant on the birth of a girl! 1/2 – Mr. and Mrs. Ari and Bruchi Gluck on Avi’s bar mitzvah! 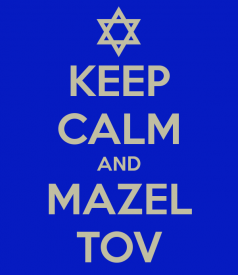 1/4 – Mr. and Mrs. Bezalel Harel on Chanoch and Aaron’s bar mitzvah! 1/19 – Mr. and Mrs. Shlome and Simie Lowy on Shuli’s bar mitzvah! 1/19 – Mr. and Mrs. David Shilman on Zevi’s bar mitzvah! 12/25 – Mr. and Mrs. Binyomin and Pearl Friedman on Chana Baila’s engagement to Simcha Greenwood from Thornhill, Toronto! 1/2 – Mr. and Mrs. Reuven Brand on Aliza’s engagement to Menachem Resnick! 1/17 – Mr. Yonason Witonsky on his engagement to Rina Hoffner-Friedman!